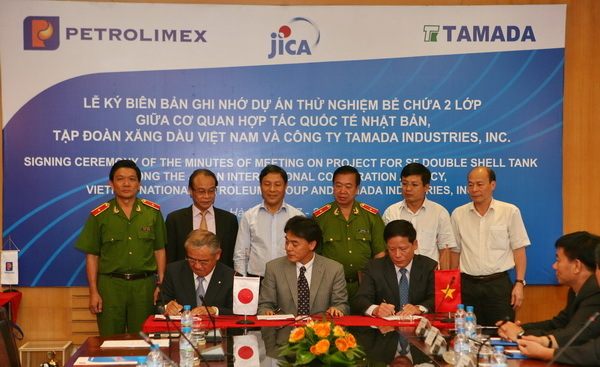 Attending the signing ceremony were Mr. Mutsuya Mori,Chief of Jica Vietnam, Mr. Yoshiaki Tamada, Executive Director of Tamada, Mr. Bui Ngoc Bao, Chairman of Petrolimex Board of Management , Mr. Tran Van Thinh, Petrolimex Director General, Mr. Ngo Quang Toan, Chairman of Petrolimex Joint Stock Installation Company (PCC1), Mr. Pham Minh Tam, Director of PCC1 and their staff. Witnessing the ceremony were Vice Minister of Ministry of Natural Resources and Environment Dang Huy Dong, Major general - General Director of Fire fighting, Rescure and Salvage Dept Do Van Son together with representatives of related authorities of Ministry of Planning & Investment Portal, Ministry of Natural Resources and Environment, Ministry of Industry and Trade and mass media of Vietnam. Double-shell tank is the steel fiber reinforced plastic double shell tank , abbreviated as the SF cover, to protect and curb the possible leakage of harmful agents such as oil products, chemicals,,, with a view to ensuring safety for the content in the tank, sanitation, environment and protection against fire and explosion better than the bitumen coated tanks in use now in Vietnam. Besides, the double shell tanks in the trial project would allow easier maintenance, longer life for products, reduced cost for installation, inspection and repair than bitumen coated tanks in use now. Suggested by Jica, the Japanese government selected Tamada co cooperate with Petrolimex in developing this project. Petrolimex appoints PCC1 to directly work with Tamada in the production, installation, test and evaluate the products. PCC1 is a member of Petrolimex, specialized in the production and installation of oil and gas projects. PCC1 has a long history and is a pioneer in applying scientific technology in many high quality projects. One of the model project by PCC1 is the petroleum bonded warehouse at Van Phong. The installation for evaluation will be made in two Petrolimex retail stations in Hanoi and Ho Chi Minh City. After the trial project is successful , the parties will apply the production technology on the production en mass in Vietnam.